Despite dressing fewer than 20 players, Greely is 3-2 and remains competitive in Class B South. CUMBERLAND — Greely High’s football team represents the biggest problem facing Maine high school football – a team without enough players. But the Rangers are also a surprising exception. Despite dressing 18 or 19 players per game, and playing in Class B, they keep winning. The Rangers are 3-2 and host Biddeford (2-3) on Friday. Even its 22-0 loss to defending Class B champ Marshwood distinguished Greely. No other team has kept Marshwood (5-0) under 40 points. Greely does have some team strengths: Ten seniors, some good-sized linemen and coaching continuity under hard-driving coach Dave Higgins. 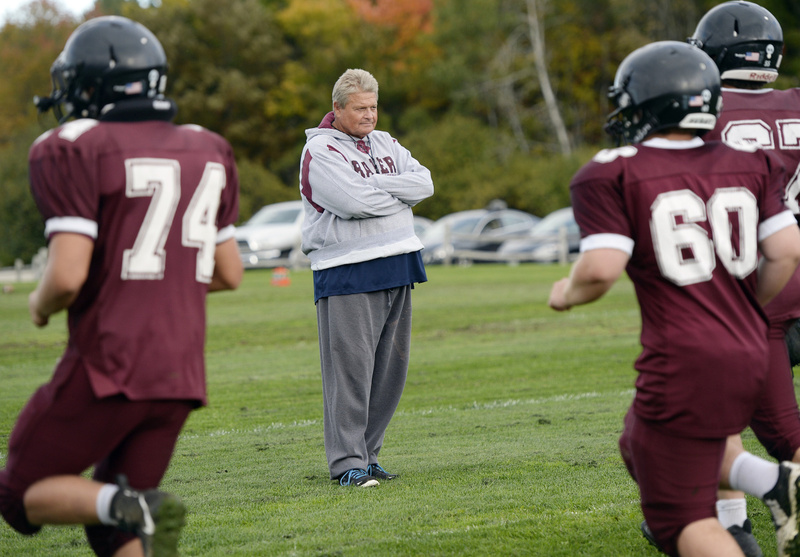 Greely Coach David Higgins keeps a careful look at his players during practice, making sure they are prepared for the next game. “Coach puts us through the wringer. Every day is a grind. No one likes it but it honestly prepares us for games,” said senior captain Jackson Williams, the team’s middle linebacker and left tackle. After a season-opening 14-0 loss to Noble (4-1), Higgins said he hadn’t done enough to prepare his team. He had them ready for Week 2. Greely ran over Mt. Blue, 56-18. Greely also beat Cape Elizabeth 20-14, and last week trounced Westbrook, another team struggling with roster size, 42-6. Among the seniors are Joey Cassella, a hard-running back and a two-time all-conference player; quarterback Nicholas Male; running back Will Schumacher, who rushed for 174 yards against Westbrook when Cassella was out with an ankle injury; and sturdy linemen like Will Neleski and Santana. Greely has won a playoff game in each of the past three seasons. In those seasons, Greely never had a large roster but it was at least in the low 30s. This year’s team has adapted by making sure each player can handle different positions and using everybody during a game. “I’m comfortable with anyone being in the game,” Williams said. The Maine Principals’ Association has no minimum requirement for football rosters, but recommends having at least 20 players. Greely’s middle school football team combined with Yarmouth this year. 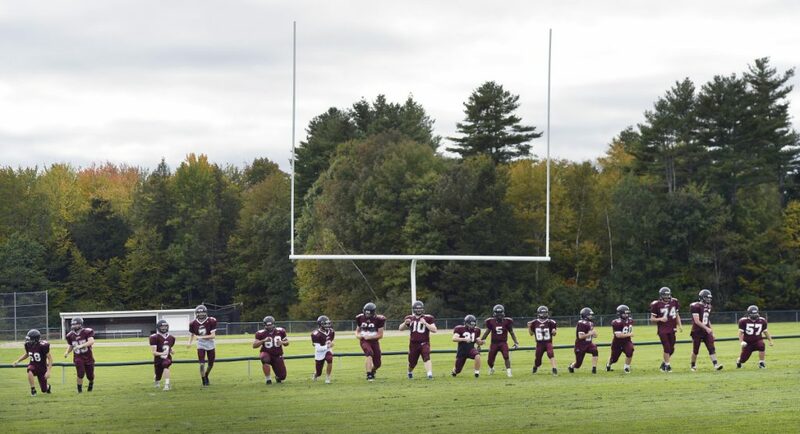 “We have three eighth-graders playing football,” said Greely Athletic Director David Shapiro. After this season is over, Shapiro said he will “sit down with my football players,” and discuss future options. Those would include eight-man football if it is adopted by the MPA, continuing as an 11-man program, or forming a co-operative team with another school. Shapiro doesn’t want to think about a fourth option: no football. “That would be a real unfortunate option,” he said. For this season, Greely will continue to strive for its version of success. “Success for us is just to know that at the end of the day we gave it everything we had until the very last play of the season and that’s how it’s always been. It’s never changed,” Cassella said. CLASS C SOUTH playoff positioning is at stake this week. No. 2 Fryeburg (4-1) is at No. 1 Leavitt (5-0). Up-and-down No. 5 Cape Elizabeth (2-3), coming off an impressive 33-7 win against York, is at equally unpredictable No. 3 Gardiner (3-2). And, No. 4 York (2-3) is hosting No. 6 Morse (3-2). SATURDAY’S CLASS A showdown between Scarborough (4-0) and Thornton Academy (5-0) begins at 3 p.m. in Saco. See Saturday’s Press Herald for an in-depth look at the game. STATE OF THE STATE: Press Herald reader Gary Dube of Gorham said in an unprompted email: “Never in my 40-plus years do I remember such disparity in high school football contests.” Dube has a point. Week 5 saw 30 of 38 games decided by 20 or more points and over half (20 of 38) were by more than 30. Only three games were decided by 10 or fewer points. The average margin of victory was 29.63 points, the highest this season and well above the four-week average of 23.91 points.